I know what you’re thinking – my last post, only a week ago, was about a birding camp. 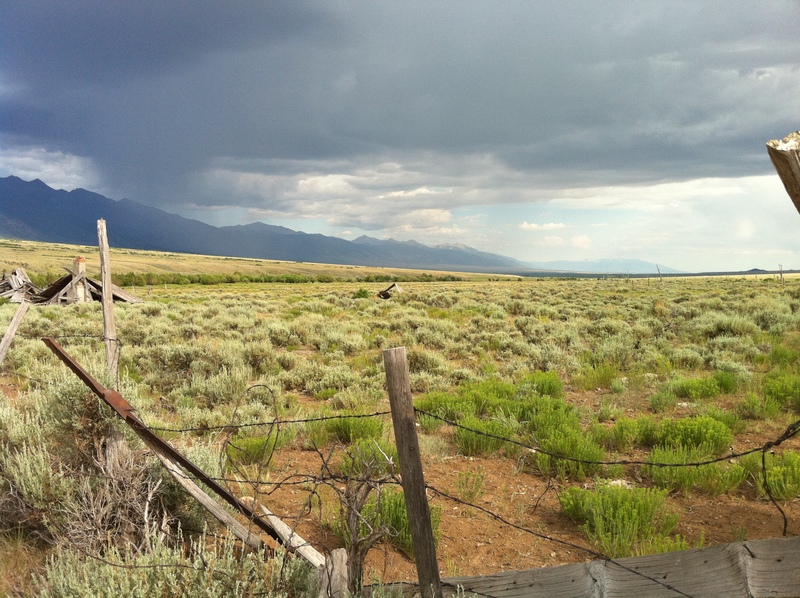 Well, I was lucky enough to be able to go to the American Birding Association’s Camp Colorado as well. I joined 16 other avid young birders to bird the various habitats that Colorado has to offer, from Rocky Mountain peaks to sagebrush plains. Leading the group were excellent birders, Michael O’Brien and Louise Zemaitis (VENT tour leaders) and Chip Clouse from the ABA. Michael is a co-author of The Shorebird Guide and the ground-breaking CD Flight Calls of Migratory Birds, in addition to being one of the best birders in the country. Needless to say, we were in for a great week. I arrived at the Colorado Springs airport a bit before 1:30pm on the afternoon of June 26, only to find that I had just missed the first van taking kids to camp. No matter, I’d just wait a bit for the next one. Well, it turned out that the “next one” didn’t come until after 6pm… I used the time to finish reading a book I had started on the plane and talk to the few campers that had already arrived. We got to our camp, just outside of Woodland Park, CO, as it was getting dark. Everyone had been assigned a tent to share with a few other campers, but since it was raining the leaders decided to let us all sleep upstairs in the main building that night. The next day we got up early (this would become a regular pattern) and headed out to the Hayman Burn area, a place where a huge fire had swept through in 2001 and was in the beginnings of regrowth. On the way we stopped at a marshy area and found some really nice birds, most surprisingly a whole flock of Evening Grosbeaks, one which landed only about 30 feet from us! We also saw western birds like Brewer’s Blackbird, Band-tailed Pigeon, Black-headed Grosbeak, Western Bluebird and Violet-green Swallow. 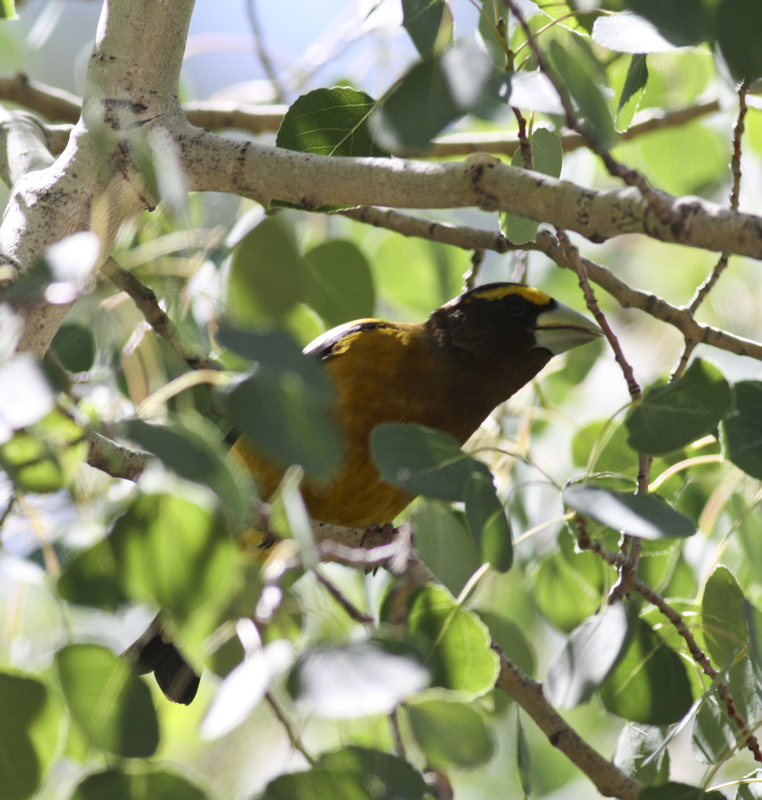 A cooperative Evening Grosbeak in the Hayman Burn area. We traveled to different spots within the burn area, finding Mountain Bluebird, Townsend’s Solitaire, Western Tanager and Red-naped Sapsucker. Chip led us to his Breeding Bird Atlas territory, a census that lasts 5 years and documents what species of birds breed where in the state. We split up into groups and attempted to find and “confirm” different species in the area, by finding evidence that they were breeding. My group was able to confirm MacGillivray’s Warbler, Mountain Chickadee, and Hammond’s Flycatcher. Other spots we birded that day included a grassland area (Western Meadowlark, Vesper Sparrow), and around our camp once we returned. Good birds there were breeding Williamson’s Sapsuckers and a group of Clark’s Nutcrackers flying over the ridge. Michael O’Brien gave a terrific presentation on birding by ear in the afternoon. 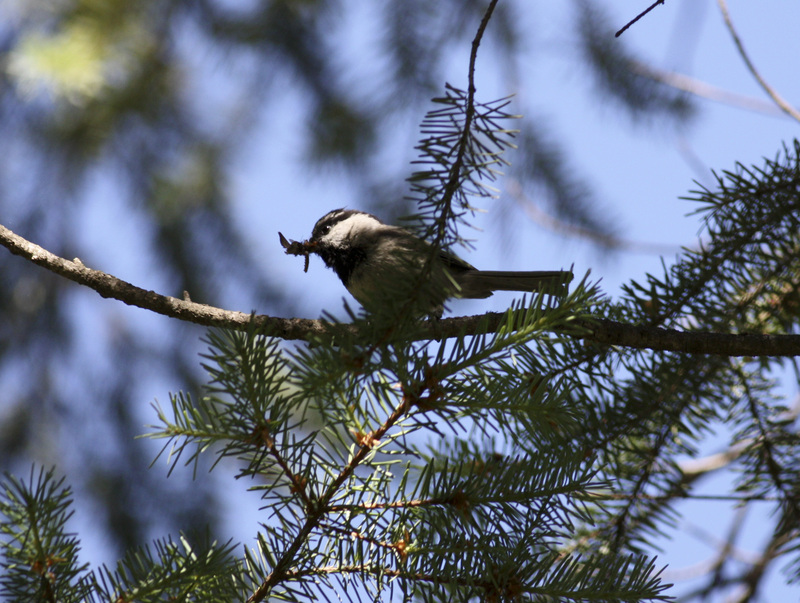 Mountain Chickadee carrying food -- confirmed! 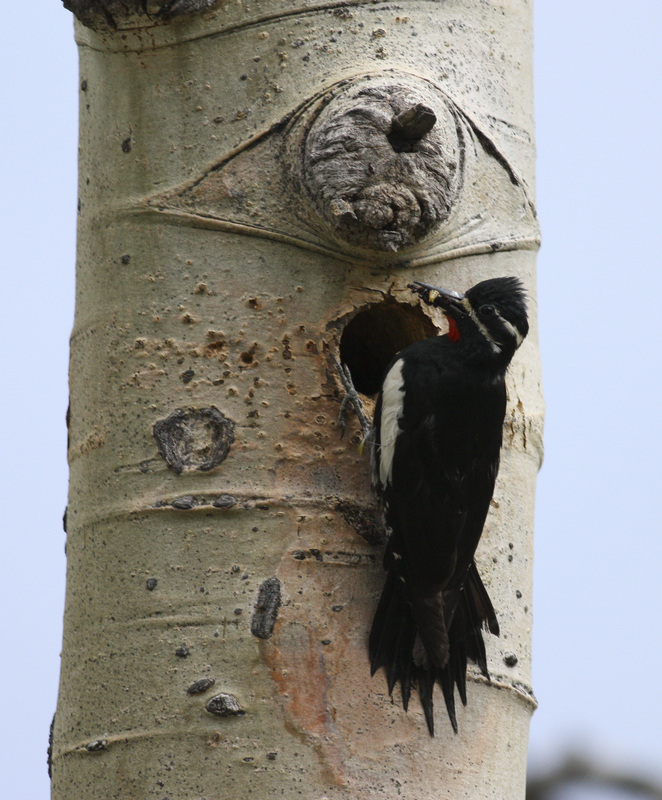 The male Williamson's Sapsucker at his nest.